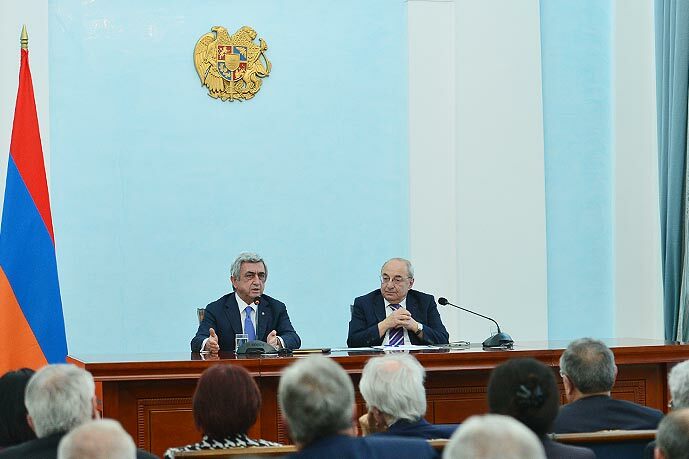 Meeting with members of the Public Council on Wednesday, the Armenian leader answered questions that concerned the April 2-5 deadly clashes with Azerbaijan in Nagorno-Karabakh as well as prospects of the negotiating process on the issue. “Let no one doubt that we are going to achieve the realization of all our goals with confident steps,” Sargsyan said, as quoted by his press office. “First of all, we should maintain the joy of victory in our society, belief in our own strength. Each of us should become an advocate of unity, a uniting leader. When we are united and confident in our strength, no one can harm us. And today we are united and confident in our strength,” the Armenian leader emphasized. More than 90 Armenian soldiers were killed and more than 120 were wounded in fierce battles in Nagorno-Karabakh sparked by an Azerbaijani offensive early last month. The Armenian military claims to have killed up to 1,500 Azerbaijani soldiers and wounded nearly 3,000, as well as destroyed a considerable amount of enemy materiel, including tanks, armored vehicles, pieces of artillery, aircraft, etc. Azerbaijan, where military casualties are considered to be classified information, has admitted only 31 killed soldiers, whereas independent sources speak about nearly a hundred dead Azeri soldiers in Karabakh clashes. Immediately after the hostilities the Armenian leaderships in Stepanakert and Yerevan admitted the loss of some “insignificant” portions of territory in the buffer zone. Unverified reports in the subsequent weeks suggested, however, that the Armenian military may have regained most of the lost ground since then. In an interview with Bloomberg on April 22 President Sargsyan suggested that the goal of Azerbaijan’s April campaign in Nagorno-Karabakh was to punch through the defenses into Nagorno-Karabakh proper and then “issue an ultimatum” to the Armenian leadership, something that he said Baku had failed to achieve. Sargsyan’s yesterday’s remarks came amid continuing tensions in the Nagorno-Karabakh conflict zone where loss of life continues despite the April 5 ceasefire agreement. Leaders in Azerbaijan, which presents the April events as a “successful rebuttal of Armenia’s aggression”, continue their belligerent rhetoric, threatening to resolve the dispute militarily.